What is a composting toilet? A composting toilet is an environmentally friendly and low cost solution for waste management when you don't have access to a sewer connection or septic system. Sun Mar compost toilets are clean, odorless, easy to install, and cost thousands less than a septic system. 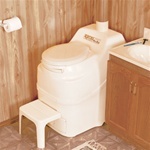 Composting toilets can be installed anywhere you need a toilet: home, office, pool house, cabin, boat, RV... anywhere! Let the experts at the Composting Toilet Store help you with the perfect bathroom solution. At the Composting Toilet Store, we are passionate about the environment, and more specifically, about water conservation. Water shortages are a growing reality for many communities across the United States today. In the coming years, it will be more important than ever to find creative new ways to conserve water. We believe that the products we sell here are one part of the solution. Our waterless toilets create no pollution, evaporate all liquids, and utilize naturally occurring aerobic bacteria to produce a clean, dry compost as the only end product. By recycling waste back to the earth the natural way, we can reduce our negative environmental impact on the earth. Do something great for the planet by switching to a waterless compost toilet! The products we sell can generally be broken down into two categories: self contained and central systems. Our most popular self-contained unit, the EXCEL is great for daily residential use. Our CENTREX central systems provide the added option of low flush toilets in addition to the standard waterless option. If you're not sure which of our compost toilets is right for you, the best place to start is our Product Selection Guide. This will give you the basic information you need to narrow down your range of choices: capacity (how many people can use the toilet on a daily basis), whether the system uses water or is waterless, and whether it's electric or non-electric. We have a range of options in each of these categories, so we're sure you will find something that's right for your home and your family. If you need assistance in finding something or just have some questions, please don't hesitate to contact us at 800-690-0132. We are always happy to help! Compost toilets are also a great eco-friendly solution if you're looking for septic system alternatives. A septic system that is old or failing can be a continual drain on your pocketbook, not to mention a real threat to the environment. For homeowners living on or near lakes and other bodies of water, a failing septic system can spell disaster if untreated waste water is leaching into the freshwater body. In fact, in many areas, it is prohibited to install a septic tank within a certain number of feet of any body of water. The products we sell here are a great alternative to replacing an old or failing septic tank, and they cost thousands less than a new septic system. Anytime you make a modification to your home and its fixtures, building code is an area of concern. Most local governments in the United States have adopted their own set of building codes and ordinances, and homeowners wishing to make modifications to their homes must educate themselves about these codes and abide by them. To that end, we have compiled a section of this website dedicated to building codes and regulations related to composting toilets that will help you find the information you need and the resources to contact for your own local building code enforcement. We've got some basic history about how building codes have evolved in the United States. In this informational section, you will also find listing of state-level government agencies and other organizations that deal with building codes, so you can look up the right people to contact in your state. Why are we a Sun-Mar dealer? That's simple. Sun-Mar is the world leader in compost technology. And most importantly, Sun-Mar compost toilets are the ONLY units certified by the NSF to comply with NSF/ANSI Standard #41 for residential and cottage use. This means they have been tested at maximum capacity and have been certified to operate odorlessly and produce a clean, dry finished compost. 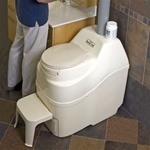 When you purchase a Sun-Mar, you are literally purchasing the standard in composting toilets.